All three of the herbs usually referred to as �tarragon� are from the Compositae (sunflower) family. These three plants share the same rich, anise/licorice flavor that is indispensable to many French and English recipes. The true French tarragon is Artemisia dracunculus, indigenous to Russia and western Asia, but has a permanent place in Western cuisine, and is especially popular in France, England and the United States. It appears to have the �purest� flavor, and is usually grown from cuttings rather than seed. The plants grow to a height of about 2 - l/2 feet. �French� leaves are smoother, glossier, darker and more pungent and aromatic than those of the Russian plants. The English word tarragon is a corruption of the French word estragon, or �little dragon�, derived from the Arabic tarkhun. Various folklore beliefs were that tarragon was good for treating the bites of venomous snakes, while others thought the name was due to the coiled serpent like roots of the plant. The Russian plant is thought to be less flavorful than the true French tarragon, and is more robust, growing to a height of about 5 feet. The ancient Greeks and Romans did not include artemisias in their kitchen repertoire and it was only rarely mentioned during medieval times. The Arab botanist and pharmacist, Ibn-al-Baytar of Spain, mentioned it as a breath sweetener, sleep aid and as a seasoning for vegetables. It was not until the 16th century that tarragon could be considered one of the condiments of the Western world. True tarragon does not like our summer heat and is not very permanent in the garden. Often people who purchase tarragon plants believe they are getting the French variety but have purchased the Russian one, instead. 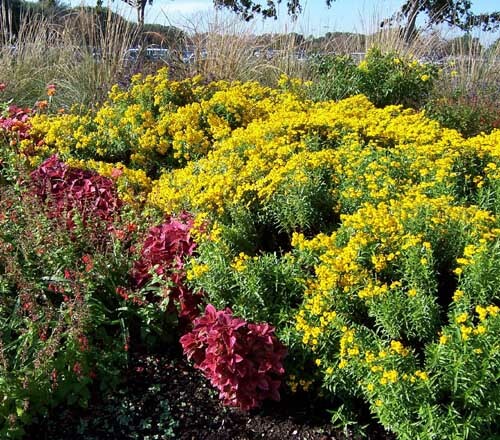 Both do best in warm, dry, well-drained light soils in a sunny location. Protect from severe frost and �wet feet� � mulching sometimes helps it withstand cold weather. These two plants do not do well from seed and their flowers are rather obscure, and whitish-green. Cut the tops of the plants a few inches above the ground several times during the growing season, dry in the shade and store stripped in containers to preserve the aromatic, licorice-anise aroma. An oil is made from tarragon that is used in the manufacture of pickles, flavoring of liquors and vinegars. The taste is good with chicken dishes, and can be mixed into fines herbes mixtures, fish sauces and tomato juice. Because of the strength of the flavor, add sparingly and taste during the process of creating the flavoring at hand. Tarragon vinegar is especially good as salad dressing, or for adding flavor to sauces such as b�arnaise, tartare and hollandaise. Brush chicken, inside and out with lemon juice and salt. Mix butter with tarragon and generously rub skin of chicken, saving some of the tarragon butter to place in the cavity of the chicken. Place bird on rack in roasting pan, roast in moderate oven (375F) for l hour and 20 minutes or until done. Baste occasionally with pan drippings. Serve with roasted potatoes, cooked carrots, green beans and white onions. Even if it is difficult for us to grow tarragon here in Texas, Mother Nature has come to our rescue with the Mexico/Southwest US native, Mexican Marigold Mint. This sprightly, perennial plant has small golden flowers in the fall and can easily take the place of the longed-for tarragon in our kitchens. It, too, has a wonderful anise/licorice smell and taste. On an average plants grow about 3 feet tall, but there is a shorter strain available occasionally. They also thrive in hot, dry places in full sun in the flower bed. Dig the clumps every 2 or 3 years and reset. Use the same concepts for vinegar making and for drying leaves, although the fresh leaves seem to be the best to me. A little about "what's in a name?" - When we read the Latin name of Russian tarragon � Artemisia dracunculoides � we usually see the word �Pursch� behind it. This lets the reader know who applied the new name to the plant in question � in other words, who introduced it to the rest of the reading public. In this case the word refers to a German plantsman, Frederick Traugott Pursch (1774-l820). Who was he, really? He gathered his knowledge of plants at the Dresden Botanic Garden, and emigrated to the United States in 1799 to settle in Philadelphia, then a major center for plant activity in America, and worked from 1802-5 in �The Woodlands,� the garden of William Hamilton, who was a well known horticulturist and sometime politician in Philadelphia. Pursch soon became friends with such famous horticulturists as Bernard McMahon, John Bartram, and Benjamin Smith Barton. His special interest was the study of the new flora of North America. Plants collected by the Lewis & Clark Expedition were shared with him so that he could study and place them. It was Pursch who named the wildflower Clarkia pulchella for William Clark. In 1805 he went on a collecting ramble from Maryland to the Carolinas and back, with only his gun and dog. In 1806 he traveled north from the mountains of Pennsylvania to New Hampshire and returned, again travelling almost all the way on foot. But Pursch�s fortunes changed when he departed for England and carried away some of the specimens entrusted to him by the Lewis & Clark expedition. He finished his book on the systematic arrangement and description of the flora of North America (Flora Americae Septrionalis) in 1813 � without ever returning the specimens to Clark - which created further rancor. He arrived in Canada in 1816 but received a great setback when ultimately his collections were destroyed by fire and he fell into poor health due to alcoholism. When he died in Montreal in 1820 his friends had to defray his burial expenses. His remains were moved from the Popineau Road Cemetery in 1857 to the Mount Royal Cemetery and a monument was raised in his honor by the members of the Natural History Society of Montreal in 1878. Pursch is remembered in the name of the �bitterbush� (Purschia) and by several other designations, such as Rhamnus purschiana, a species of buckthorn. It�s interesting to realize that there are many stories behind the names of the plants we have in our gardens woodlands and pastures.